Screenagers is the updated, academic edition of the previously-published Playing the Future. 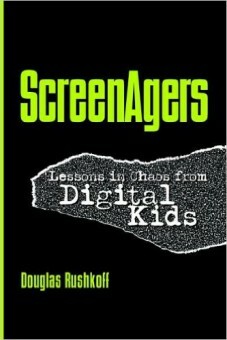 “Media theoriest Douglas Rushkoff sees the current cultural moment as a true renaissance, fueled by new technologies, media, activities, and ideas. Posing that the current leap into digital culture marks as profound a shift as from orality to literacy, he looks to the world of the young people he calls ScreenAgers for clues about what the future has in store. This book makes a far-reaching, astonishingly accessible case for the positive impact that digital technologies will have on our ability to participate more actively and thoughtfully in the chaotic landscape ahead of us.